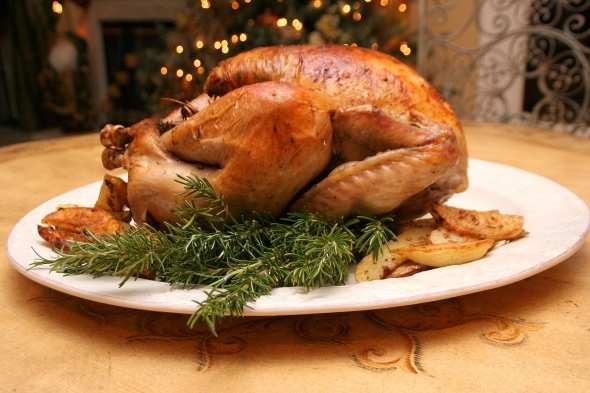 Brining is the key to this incredibly moist and tender turkey. Be sure to have plenty of fresh rosemary and thyme on hand to create this simple yet flavorful turkey that will compliment any Thanksgiving dinner spread. Prepare Brine: Tie rosemary and thyme sprigs together with kitchen string. Bring water, salt, pepper, sugar, garlic and herb bunch to a boil in a large pot stirring occasionally as needed until salt and sugar dissolves. Remove from heat and cool to room temperature. To speed cooling process add ice cubes and refrigerate until completely cooled. Remove neck, heart and gizzard from turkey. Insert 1 oven bag into second bag; place in large deep bowl. Slide turkey, breast side down, into doubled bag. Pour brine (garlic pieces and herb bunch included) into bag. Press out any air and seal bag. Refrigerate turkey in brine (still in bowl) for 24 hours, turning entire bag over once halfway thru. Remove turkey from brine. Rinse turkey inside and out with cold water then pat turkey very dry with paper towels. Refrigerate turkey uncovered. Preheat oven to 350 degrees with rack in lowest position. Stir all ingredients for the lemon- olive oil rub in a small bowl. Rub lemon- olive oil rub inside cavities and all over turkey, running fingers gently under skin to spread oil mixture underneath. Place turkey, breast side up, on rack set in large roasting pan. Tie rosemary and thyme sprigs together with kitchen string. Place garlic bulbs then herb bunch inside main cavity. Tie legs together and tuck wing tips under. Pour two cups of water into roasting pan. Roast turkey until thermometer inserted into thickest part of thigh registers 165°F, about 2 ½ hours (add additional water to roasting pan if pan is dry and baste occasionally during the last hour as needed). Rotate pan halfway thru to cook evenly. Remove from oven and tent loosely with foil; let rest at least 30 minutes. (Internal temperature will rise 5 to 10 degrees) Reserve pan juices for gravy or topping. Transfer to platter and serve. *Grind peppercorns using coffee grinder.